Warragul City Motors in association with Warragul, Leongatha and Latrobe City Cycling Clubs brings you a 24 race, best of 15 combine series from March through to November 2018. We have 24 races in the series with $1000 series prize money thanks to Warragul City Motors. Check out the points system below. To get in the money you’ll need to race as many races as possible. 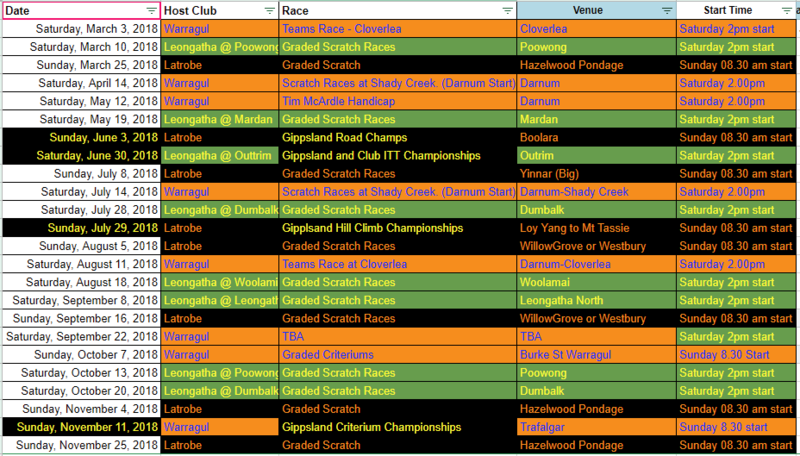 You will notice the Gippsland Championship Races are included in the series. There is something for everyone. Handicaps, Teams races, a Time Trial, Scratch Races, Criteriums, Hill Climbs and a range of circuits. Get training and get racing. Invite your friends along to. Members from all clubs are welcome. Spread the word. There may be slight alterations to the calendar if permit approval is difficult. Keep checking back to the live calendar by clicking here. We will also update our website’s calendar. Series prize money will be awarded to the top 12 point scorers in the series. Points are accumulated for a riders best 15 races of the 24 race series. 5 points for starting if you pre enter online. 3 points for walk up starts. 5, 4, 3, 2, 1 additional points for top 5 place getters. 5 points for starting if you pre enter online. 3 points for walk up starts and you are not likely to get a great handicap. 10,9,8,7,6,5,4,3,2,1 additional points for top 10 place getters. Have fun. We are not racing for sheep stations. The club hosting the race is responsible for racing on the day. They set up the course, determine the race format and distance. The host club will determine if racing is cancelled. Grading will be determined in consultation with the 3 clubs. Club Delegates listed below are responsible for grading. Host club is responsible for updating results on the results spreadsheet and series points totals. Any changes to series dates or rules need to be approved by the club delegates.